These durable Plastic Sports Bottles are custom imprinted with your design in one to four colors. Each of our classic, Squeezable Sports Bottles holds 32 ounces of water or the beverage of your choice. The Custom Sports Bottles come with either a flexible straw or push and pull cap. Choose from seven different Custom Sports/Water Bottle colors: frosted, granite, neon green, neon orange, neon pink, neon yellow, and white. Four different cap and straw colors are available: black, blue, red, and white. Your design is custom imprinted in the color of your choice on one or two sides of the Sports Bottles. The imprint area is 4" wide by 6" high. The minimum order for 32 Ounce Custom Sports Bottles is 150 Bottles. Production time is seven to ten days after proof approval. 67000 32 oz. 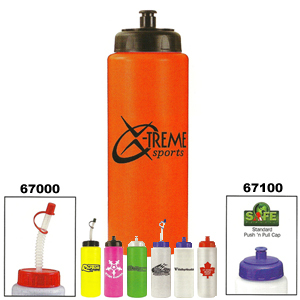 Sports Bottle with Flex Straw 1.03 .96 .91 .89 .86 4" 6"
67100 32 oz. Sports Bottle with Push/Pull Cap 1.26 1.21 1.17 1.15 1.12 4" 6"
NOTE: Standard imprint is one-sided imprint. Two-sided imprint is available at no additional charge for one-color designs only. It's easy to get started with your Custom Squeezable Sports Bottles. Simply email your camera ready AI or EPS vector art file to graphics@kardwell.com and then contact us at 1-800-233-0828. For a FREE Catalog or more information on Custom-Imprinted Glasses, pleas contact us at 1-800-233-0828.